Argentine ants are a fact of life in many parts of Australia, but can still potentially be banished from Norfolk Island. Amid all the usual items we expect to see in the federal budget was one that raised eyebrows: A$28.8 million for three ant eradication programs. Yet amid the inevitable media puns about the government “upping the ant-e”, we should note that these funds are for the continuation of existing programs that have already attracted significant funding and made substantial progress. Stopping now would have meant previous funding was wasted. The funds will go a long way towards protecting Australia’s economy and environment from the damage wrought by invasive ants. But despite the apparent cash splurge, it nevertheless falls short of what is really needed. Of the $28.8 million, $18.3 million was for the National Red Imported Fire Ant Eradication Program. These funds are part of a $411 million, ten-year program begun in 2017 to eradicate red imported fire ants from southeast Queensland, the only place they are found in Australia. Removing these pests will avoid an estimated $1.65 billion in total costs to 19 different parts of the economy. With previous funding, the program eradicated these ants from 8,300 hectares near the Port of Brisbane, making it the world’s largest ant eradication to date. The Yellow Crazy Ant Eradication Program was allocated $9.2 million over three years. Yellow crazy ants have caused a cascade of ecological effects on Christmas Island, and at their peak abundance temporarily blinded a Queensland cane farmer with their acid spray. The Wet Tropics Management Authority, which runs the program, had requested $6 million per year for six years to continue removing the ant from in and around the Wet Tropics World Heritage Area. The federal funding is $3 million short of this, and the authority is still waiting to hear whether the Queensland government will provide the remainder. Since 2013, the program has received $9.5 million from the federal government (and $3 million from the Queensland government). No yellow crazy ants have been observed in about half of the target area in more than a year. A yet-to-be published analysis estimates the benefit-cost ratio for the program as 178:1. A further $1.3 million was allocated to the Argentine Ant Eradication Strategy on Norfolk Island in the South Pacific. Argentine ants have invaded places with Mediterranean-type climates all over the world, including southwestern Western Australia and parts of southern Australia, and become firmly established. But unlike those areas, the population on Norfolk Island is still considered small enough to be eradicable, and federally funded efforts to remove them began in 2010. Yellow crazy ants in Queensland and Argentine ants on Norfolk Island directly threaten World Heritage Areas. The ants can have significant impacts on native birds, mammals, insects, reptiles, amphibians, and plants. Getting rid of them is important for meeting Australia’s international obligations to protect World Heritage sites. Ant eradication means removing all individuals of a particular ant species from a given area. The first step is to define the extent of that area. Depending on the species, this may involve visual searches and/or placing lures such as sausages, cat food, or jam to attract the ants. The public can help by notifying relevant authorities of unusual ants in their gardens, and by not transporting materials that have ants on them. The second step is treatment. Currently, the only way to eradicate ants is with insecticidal baits. Ants’ social structure makes this particularly challenging: killing the queens is vital for eradication, but queens typically stay sheltered in the nest – the only ants we see out foraging are workers. Some of the most problematic ant species can have hundreds of queens and tens of thousands of workers per nest. They can reach extraordinarily high densities, partly because invasive ant species, unlike most of our native ant species, do not fight one another for territories. Yellow crazy ants, proving it is possible to feel sorry for a cockroach. Most ant eradication programs take three to four years to fine-tune their baiting regime because of a multitude of factors that need to be considered, such as seasonal changes in ant foraging behaviour and food preference, and the desire to avoid harming non-target species. Typically, two to six treatments are required, depending on the ant species, the size of the area, and the habitat type. The hardest part of ant eradication is the end-game. Getting rid of the final 1% requires first finding them. This may mean painstaking searches through hundreds of hectares of bushland and residential areas, and the placement of hundreds of thousands of lures. Detector dogs can be very helpful, but they cannot be used in all environments and also need substantial resources for training, handling, and maintenance. Ironically, it is at this stage that public and political support for eradication programs is most likely to wane, because ant numbers are too low to be seen as a threat to the public, economy or environment. Yet it is vital not to stop now, or else the remaining 1% will simply build up their numbers again. Experienced staff are also lost when programs suffer cuts or delays in their funding. Disappointingly not mentioned in the budget was funding for eradicating electric ants. Like red imported fire ants, electric ants have a painful sting, and when left to multiply will eventually turn gardens and swimming pools into no-go zones. They also pose a significant threat to native animals such as the southern cassowary, and can blind animals as large as elephants. They are currently only found in the Cairns region. The National Electric Ant Eradication Program, funded by federal and state governments, ran from 2006 until 2017 and had likely reduced numbers down to that last 1%. The program has been running on state funding with reduced staff since then, but several new detections in the past three months demonstrate the cost of the gap in funding. In those inevitable “federal budget winners and losers” lists, invasive ants have found themselves firmly in the losers column for 2019. But it’s worth remembering that most of the world’s roughly 15,000 known ant species provide vital services for the functioning of our ecosystems. They aerate soil and redistribute its nutrients, protect plants from herbivores, disperse seeds, and repurpose dead organisms. They may even help slow down the spread of those pesky invasive ants that are much less friendly. Fire ant stings can be deadly to people who have an allergic reaction to their venom. An allergic reaction to painful tropical fire ant bites. A queen dismembered by a tetchy rival. Not welcome: the African big headed ant might be small but it can be a pest if it gets in your home. The invasive African big-headed ant (Pheidole megacephala) was found on Lord Howe Island in 2003 following complaints from residents about large numbers of ants in buildings. But we’ve managed to eradicate the ant completely from the island using a targeted mapping and baiting technique than can be used against other invasive species. Up to 15% of Lord Howe Island was thought to be infested with the ant. The African big-headed ant is one of the world’s worst invasive species because of its ability to displace some native plants and wildlife, and adversely affect agricultural production. It’s also a serious domestic nuisance. People can become overwhelmed by the large number of ants living in their buildings – you can’t leave a bit of food lying around, especially pet food, or it will be covered in ants. It remains unclear how long the ant had been on Lord Howe Island, in the Tasman Sea about 770 km northeast of Sydney, before being found. But it is likely to have been present for at least a decade. Because of the significant threat this ant posed to the conservation integrity of the island, an eradication program was started. But on-ground work done from 2003 to 2011 had many failings and was not working. In 2011, I was brought in to oversee the program. The last ant colony was killed in 2016, but it is only now, two years later, that we are declaring Lord Howe Island free from the ants. No African big-headed ants have been seen on the island for two years. The ability to eradicate this ant is largely due to its relatively unique social organisation. The queens don’t fly to new locations to start new nests – instead, they form interconnected colonies that can extend over large areas. This makes the ant’s distribution easy to map and treat. The ant requires human assistance for long-distance transport, so the ant will only be found in predictable locations where it can be accidentally transported by people. From 2012 to 2015, all locations on the island where the ant was likely to be present were formally inspected. Priority was given to places where an infestation was previously recorded or considered likely. The populations were mapped, and then treated using a granular bait available at shops. In the latter years we found 16 populations covering 30 hectares. Limited by poor mapping in the early years, we estimate that the ant originally covered up to 55 hectares, roughly 15% of the island. The widespread distribution of the ant through the populated area of the island is thought to have been aided by the movement of infested mulch and other materials from the island’s Waste Management Facility. To prevent any more spread of the ant, movement restrictions were imposed in 2003 on the collection of green waste, building materials and other high risk items from the facility. The baiting program used a product that contains a very low dose of insecticide that has an extremely low toxicity to terrestrial vertebrates such as pet cats and dogs, birds, lizard etc. The toxicant rapidly breaks down into harmless chemicals after exposure to light. No negative impacts were recorded on any of the native wildlife on the island. Importantly, the African ant usually kills most other ants and other invertebrates where it is present, so there are few invertebrates present to be affected by the bait. Ecological recovery of the infested areas was rapid following baiting and the eradication of the African ant. One of the main challenges was getting the ground crew to correctly identify the ant. It turns out there was a second (un-named) big-headed ant species present, also not native to the island, that created a lot of unnecessary work being conducted where the African ant wasn’t present. CSIRO and Lord Howe Island Board team tackling the African big headed ant problem. Like numerous other exotic ant species present, this second species was of no environmental or social concern, so there are no plans to manage or eradicate it. The protocols used in this program are essentially the same that are being used in other eradication programs against Electric ant in Cairns and Browsing ant in Darwin and Perth, because those two species also create supercolonies. We’ve got apps and radars – but can ants predict rain? It is highly likely that those programs will also achieve eradication of their respective species, the first instance where an ant species has been eradicated entirely from Australia. The fire ant program in Brisbane has many similarities, but there are distinct differences in that the ants there don’t form supercolonies that are so easy to map, and the area involved is far greater. Myrmecocystus honeypot ants, showing the repletes, their abdomens swollen to store honey, above ordinary workers. There are seven species of Apis honey bee in the world, all of them native to Asia, Europe and Africa. Apis mellifera, the western honey bee, is the species recognised globally as “the honey bee”. But it’s not the only insect that makes honey. Many other bee, ant and wasp species make and store honey. Many of these insects have been used as a natural sugar source for centuries by indigenous cultures around the world. What is fake honey and why didn’t the official tests pick it up? By definition, honey is a sweet, sticky substance that insects make by collecting and processing flower nectar. The commercial association between honey and honey bees has mostly developed alongside the long-term relationship between humans and domesticated honey bees. This association is also supported by the Codex Alimentarius, the international food standards established by the United Nations and the World Health Organisation. The Honey Codex mentions only “honey bees” and states that honey sold as such should not have any food additives or other ingredients added. Biologically, there are other insect sources of honey. Stingless bees (Meliponini) are a group of about 500 bee species that are excellent honey producers and are also managed as efficient crop pollinators in some regions. Stingless bees are mostly found in tropical and subtropical regions of Australia, Africa, Southeast Asia and the Americas. Their honey is different in taste and consistency to honey bee honey. It has a higher water content, so it’s a lot runnier and tastes quite tangy. Stingless bee honey is an important food and income source for many traditional communities around the world. Harvesting “sugarbag”, as it’s known in Australia, is an important cultural tradition for indigenous communities in northern and eastern regions. Stingless bee honey production hasn’t reached the commercial success of honey bee honey, mostly because stingless bee colonies produce a lot less honey than an Apis honey bee hive and are more complicated to harvest. But keeping stingless bees in their native range for honey, pollination services and human well-being is an increasing trend. Bumblebees also make honey, albeit on a very small scale. The nectar they store in wax honey pots is mostly for the queen’s consumption, to maintain her energy during reproduction. Because very few bumblebee colonies establish permanently, they don’t need to store large quantities of honey. This makes it almost impossible to manage these bees for honey production. Bees aren’t the only hymenopterans that make honey. Some species of paper wasps, particularly the Mexican honey wasps (Brachygastra spp. ), also store excess nectar in their cardboard nests. Local indigenous communities value these wasps as a source of food, income and traditional medicine. Ants have similar lifestyles to their bee and wasp cousins and are common nectar foragers. Some species also make honey. “Honeypot ant” is a common name for the many species of ant with workers that store honey in their abdomen. These individuals, called repletes, can swell their abdomens many times the normal size with the nectar they gorge. They act as food reservoirs for their colony, but are also harvested by humans, particularly by indigenous communities in arid regions. Close-up of three large replete honeypot ants (Myrmecocystus mimicus) at Oakland Zoo. These ants don’t just collect nectar from flowers, but also sap leaks on plant stems (called extrafloral nectaries) and honeydew produced by hemipteran sap-suckers like aphids and scale insects. Aphids and scale insects aren’t all bad – they produce a delicious sugary syrup called honeydew. We mostly know these insects as garden and crop pests: warty lumps huddled on plant stems, often coated in sticky honeydew and the black sooty mould that thrives on the sugar. Males of these insect species are usually short-lived, but females can live for months, sucking plant sap and releasing sweet sticky honeydew as waste from their rears. The sugar composition varies greatly depending on both the plant and the sap-sucking species. Honeydew has long been a valuable sugar source for indigenous cultures in many parts of the world where native honey-producing bees are scarce. Many other animals that seek out floral nectar, like bees, flies, butterflies, moths and ants, also feed on honeydew. It’s an especially valuable resource over winter or when floral resources are scarce, and not just for other insects; geckoes, honeyeaters, other small birds, possums and gliders are all known to feed on honeydew. It’s also an indirect source of honey bee honey: plant sap that has been recycled through two different insect species! Honey bees are well-known honeydew collectors. In some parts of Europe, honeydew is an important forage resource for bee colonies. Honeydew honeys have a unique flavour, depending on the host tree the scale insects were feeding on. Famous examples of this specialty honey are the German Black Forest honey and New Zealand’s Honeydew honey. So why not find out a bit more about what insects are producing honey in your local region? Australia needs to spend millions of dollars more to eradicate one of the nation’s worst invasive species, the fire ant, according to recent reports. Fire ants, first detected in Brisbane in 2001, pose a major health and agricultural risk. A recent independent review of the eradication program recommended that A$380 million be spent over 10 years to eradicate the ants, on top of the A$330 million already spent since 2001. Improvements in knowledge and control methods mean that eradicating the Australian invasion is challenging, but still potentially feasible. We now face a stark choice. The fire ant eradication program began in September 2001 after the species was detected at two locations in Brisbane. By that time, it may have been present for at least five years or perhaps even longer, and large areas were already infested. Fire ants had never been eradicated from areas this large. However, improved eradication methods mean we have increased the chances of eradicating larger invasions. Most of the original funds were spent on pesticides and monitoring areas with likely infestations. Monitoring information was used to estimate how far the invasion had spread (“delimitation”) and management efforts were focused on the delimited area. The early years of the program showed that large infestations, such as those at the Port of Brisbane and Yarwun, can be eradicated when the geographic range of the infestations is known. However, when this is not the case, undetected nests beyond the known infested area can spread unchecked. In a published reconstruction of the invasion we estimated that undetected nests existed a relatively short distance beyond the delimited area. Had those nests been detected by monitoring a larger area over the first few years of the program, the ants may already have been eradicated. However, the initial focus on intensively treating known infestations rather than expanding the monitored area reflected the best available scientific advice at the time. It also reflected an urgent need to protect people from the potentially serious health consequences of coming into contact with fire ants in areas known to be infested. 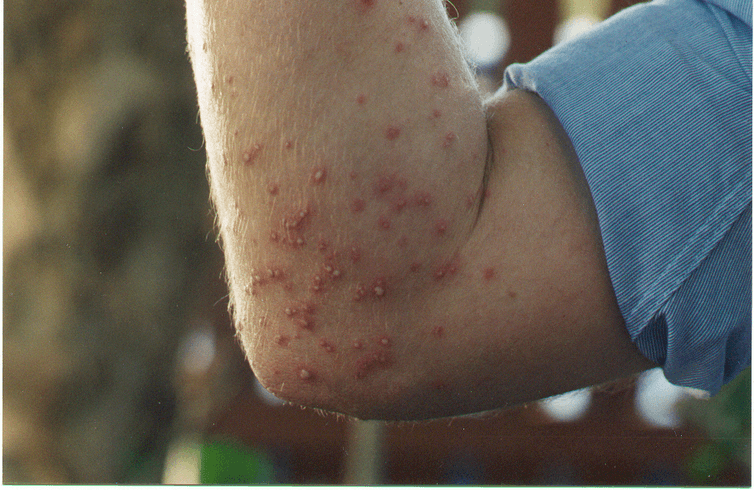 Pustules caused by fire ant stings. Although the invasion now occupies a larger area than it did when the program began, fire ant numbers have effectively been suppressed and some individual infestations have been eradicated. These facts, and the availability of a cheaper monitoring method involving remote sensing with airborne cameras, have kept alive eradication hopes. A recent meeting of agricultural ministers agreed with the finding of the independent review that eradication remains technically feasible. The review’s recommendation that eradication program funding be increased is a logical response to the invasion’s expansion. The expansion not only increased the area that requires management, thus increasing costs, but also showed that the areas previously searched and treated each year were too small to achieve eradication, implying there was insufficient annual funding. Geographic expansion of the invasion cannot continue much longer without the invasion becoming too large to eradicate. The review panel’s finding that increased funding should be made available soon is therefore timely. A lack of monitoring during the early years of the program led to the erroneous conclusion in 2004 that eradication was imminent, when in fact the invasion was expanding in area. To avoid this mistake being repeated, substantial monitoring will be required beyond known infestations and monitoring data will need to be assessed with reliable statistical methods. In a recent report we wrote to help the eradication program, we showed that the invasion boundary can be estimated with a high degree of confidence if adequate monitoring data are available. Pesticide treatment and monitoring will underpin eradication efforts. We need highly sensitive monitoring methods, including sniffer dogs and trained spotters, to confirm absence of fire ants in and near treated locations. A large enough area should be monitored to ensure all fire ant colonies are found and removed. We need continued support for community members to report fire ants, particularly in urban areas. Remote sensing will be needed in less developed areas where contact between people and fire ants is less likely. The choice is to continue eradication efforts or live with fire ants forever. Living with fire ants will incur large costs for agricultural producers and households. The most recent cost-benefit analysis of the program estimated that if these costs were added up over each of the next 70 years they would exceed A$25 billion in today’s dollars. Over half these estimated costs arise from damage to agricultural activities, with household losses being of a similar magnitude. Large numbers of people are likely to come into contact with fire ants if the species is left unchecked. Environmental damages could also be substantial. These losses far exceed estimated eradication costs. The review panel’s report makes it clear that we face an urgent choice between increased eradication funding or living with fire ants. There is not much time left to make this choice.